The House caved in last night to yet another administration demand for additional executive power, passing by a count of 227-183 a bill which allows the government even greater freedom of warrantless wiretapping. Opinions are divided on the cause of the collapse. Bush and his spokespersons had been none too subtle in threatening to cancel Congress's summer vacation unless they passed a bill he "could sign", and perhaps that did have something to do with it. Republicans continued to cast the Democratic opposition as "soft on terror" and "unwilling to take national security seriously" when they "refused to give the president the tools he needs to keep our country safe", and clearly Congressional Democrats did not want to campaign against this meme. Some analysts see the Democrats in Congress as avid supporters of the big intrusive government the Republicans have been building ever since they got their hands on the levers of power, despite claiming all the while to hate big government. Whatever the reason (or reasons) for the collapse, the fact remains that, like everything else the administration claims it needs to fight the so-called war on so-called terror, this new bill -- which the president has said he will sign into law immediately -- is perfectly suited for use against law-abiding citizens. The move caps off a week of perfectly predictable bad news, and rewards what the New York Times has called "a furious push by the White House to broaden its wiretapping authority". Historically, legislation that has been rushed through Congress in the name of national security goes further than lawmakers intended. From the Sedition Act to the Patriot Act, passing laws on the fly can have unintended consequences for Americans' rights. The Democrats should be ashamed for allowing themselves to be bullied into surrendering our civil liberties. Where is their spine? The White House has intentionally misled the Congress and the American people about the illegal warrantless wiretapping program, and now the Democrats are going to give them even more power to spy on innocent Americans who have no connection to terrorism. We need a Congress that is going to protect our rights and our Constitution, not roll over every time the administration breaks the law. Make NO mistake, we are in serious peril when an Attorney General who has subverted the Constitution per request of his boss, lied, obstructed justice, and defended torture, is now in full authority to declare who is going to be a target of warrant-less surveillance. You may not see this as seriously as I do, but then again, you have not lived under a dictatorship to know the difference. Mostly though, the people who failed most, are the citizens of this country - who should have taken to the streets and shut down all commerce, all traffic, and disengaged from the machine of government. You did not shut it down. You did not even try. I had it in mind to write an angry piece denouncing the Congressional Democrats for their latest sell-out to the Bush Tyranny, legitimizing a warrantless spy program so blatantly illegal that not even the rubber-stamps of the super-secret FISA court could stomach it. But upon reflection, I don't see any point in yet another thunderous blast at these moral cretins masquerading as political leaders. I've written many such pieces during the past six years, chronicling and condemning the Democrats' spineless acquiescence and outright complicity with the Bush gang's relentless assault on the laws and liberties of the American republic. 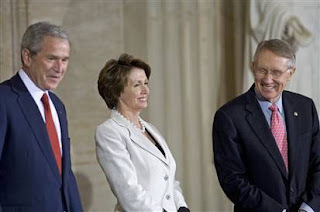 Their active participation in the Bushist coup has become glaringly evident in the months since the Democrats took control of Congress; despite having the initial backing of the majority of Americans, despite facing one of the most widely despised presidents in American history, they have retreated on every issue of substance. They have not only not stopped the Iraq War, they have funded its escalation. [...] They have not rolled back or repealed the authoritarian excesses of the Administration approved by the bootlicking cadres of the previous, Republican-controlled Congress (such as the Military Commissions Act), but have let them continue unabated. They have not instigated the impeachment of a constitutional officer, the attorney general, who has lied to their faces about a plethora of illegal activities. In six months' time, they will renew this latest tranche of dictatorial powers; with an election looming, the political fear of looking "soft on terrorism" will be even greater then than it is now, as the White House knew full well when it "compromised" on the "temporary" nature of the measure. This fall, these same Democrats will doubtless acquiesce in an extension of the "surge" after a "frank, hard-hitting but ultimately hopeful" progress report from General Petraeus. When Bush decides to pull the trigger on Iran, they will dutifully line up behind the "Commander-in-Chief." Indeed, if the increasing Republican chatter about (and open longing for) yet another "new Pearl Harbor" comes to fruition, it is very easy to imagine these Democrats agreeing to whatever "stern measures" the Bush Regime proposes: martial law, internment camps, even the suspension of the 2008 elections. There's more from Chris here. And speaking of "martial law, internment camps, even the suspension of the 2008 elections", Harvey Wasserman and Bob Fitrakis don't seem to have any illusions about where we are headed. ... on second thought, maybe they do have illusions. Personally, I'd replace the word "how" in the last sentence with "whether". The real question is whether we can stop them. At the moment, the prognosis doesn't look good. But then it never has.